You are here: Home / Travel / US National Parks / Sailing on the 1891 Scow Schooner Alma at San Francisco Maritime National Historical Park! 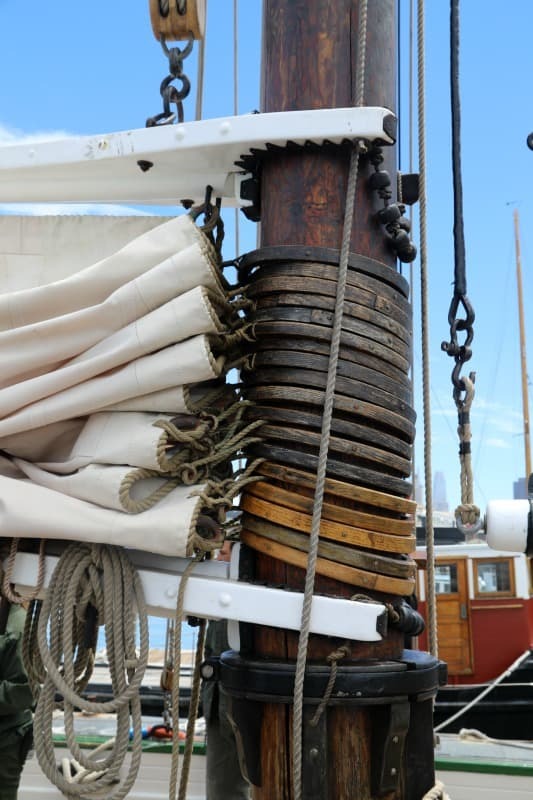 Did you know that you can go sailing on the 1891 Scow Schooner Alma at San Francisco Maritime National Historical Park! How cool is that!!! 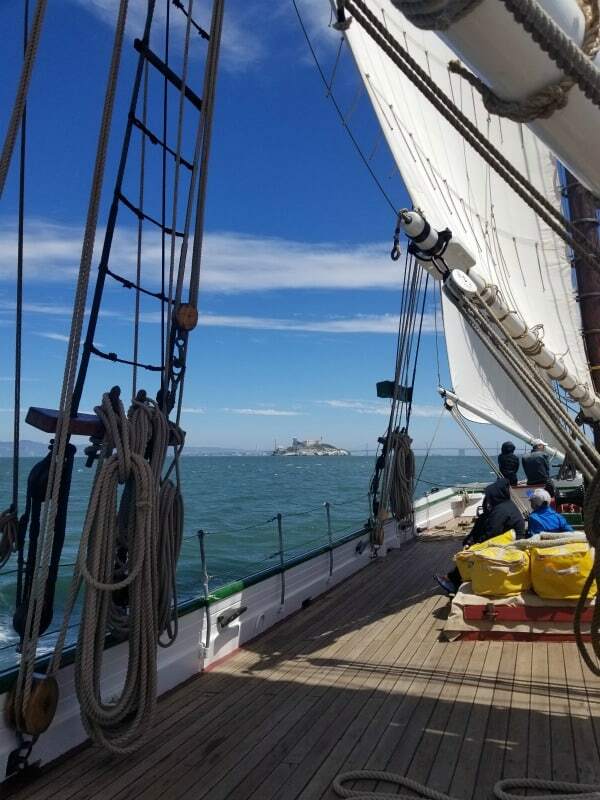 From June 9 – November 17, 2018, you can haul lines and raise sails, or sit back and relax, as you explore San Francisco Bay aboard the 60-foot scow schooner. 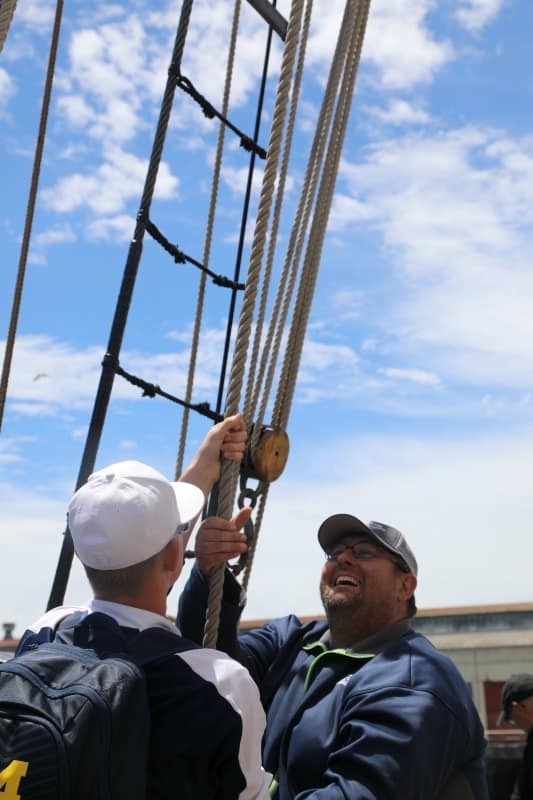 During this unique and educational National Park Service sailing program, Rangers will share stories about Spanish explorers, the Gold Rush, Fisherman’s Wharf, and more! This may be one of the most amazing National Parks experiences I have had to date! 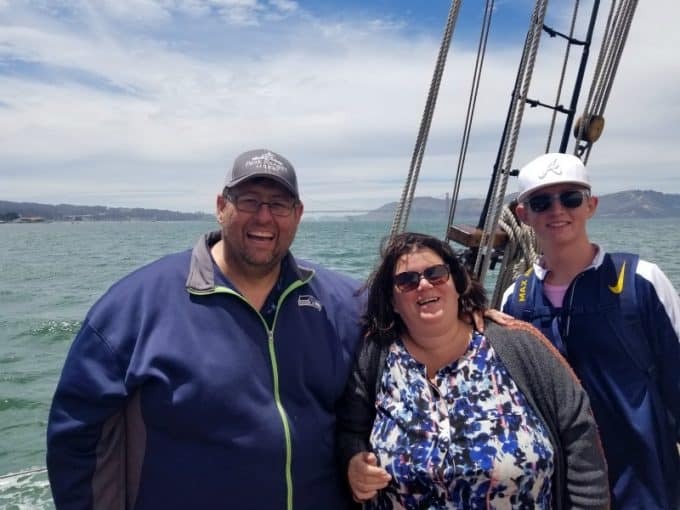 We spent close to three hours sailing in San Francisco Bay and soaking in all of the sites. 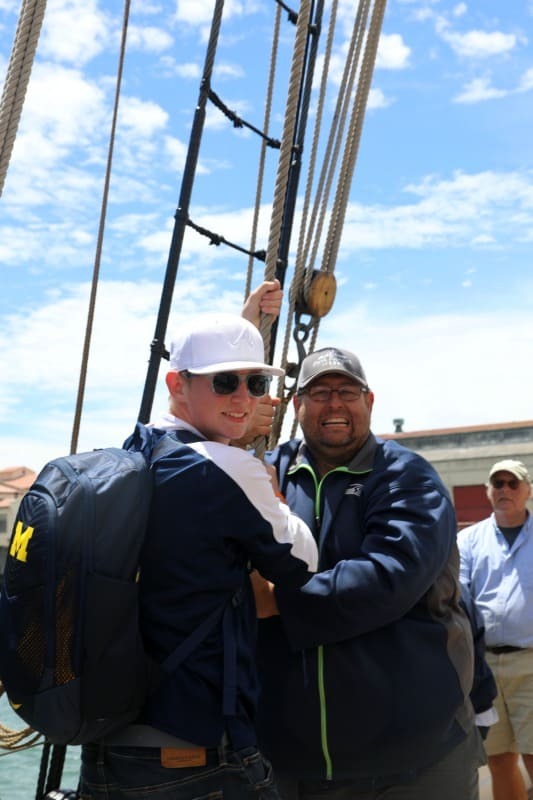 My nephew Nathan was with us in San Francisco and we worked together to help raise the sails. Can you tell from my smile how excited I was? 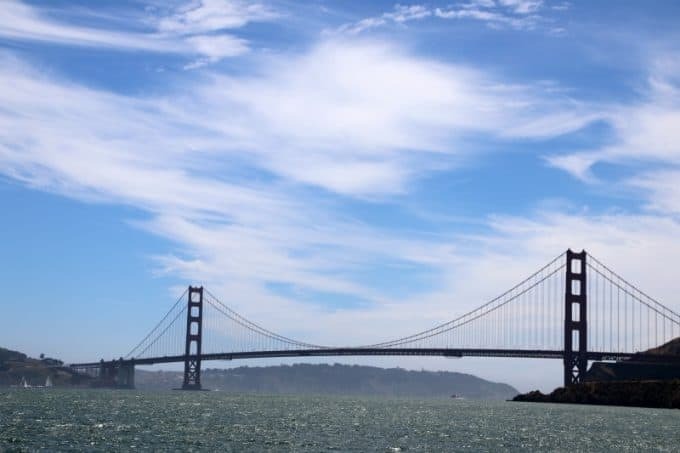 Sailing by the Golden Gate Bridge was a total National Park Bucket List moment! We learned that in 2017 they were able to sail the Alma under the bridge a few time. 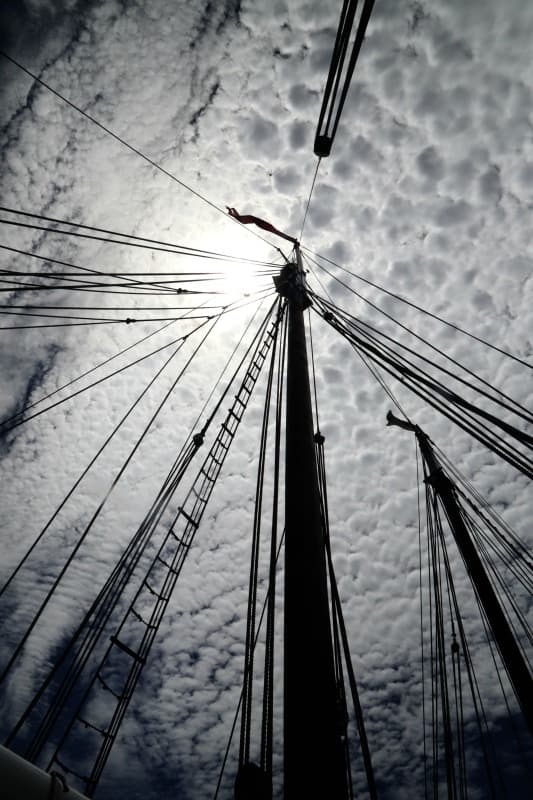 It depends on the weather, winds and boat traffic during the sailing. 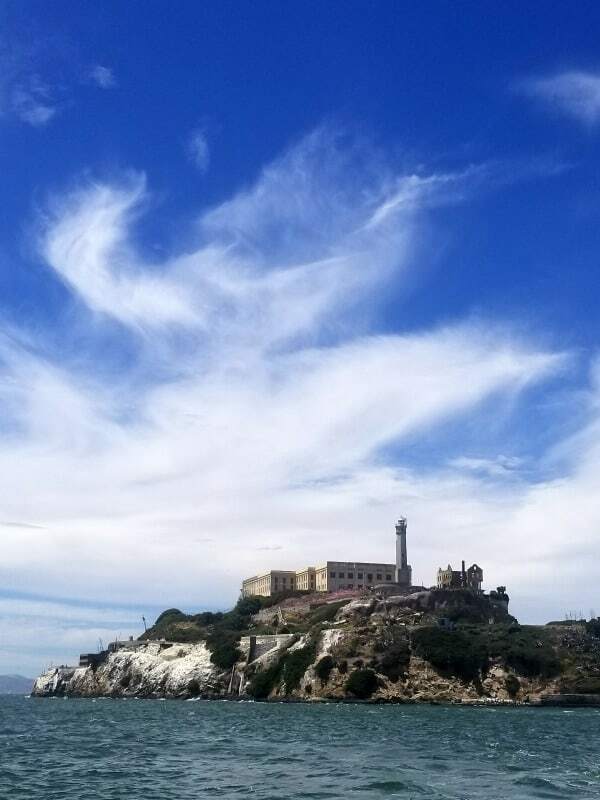 One of the highlights of the trip was sailing near Alcatraz Island. It was really cool seeing more of the island. 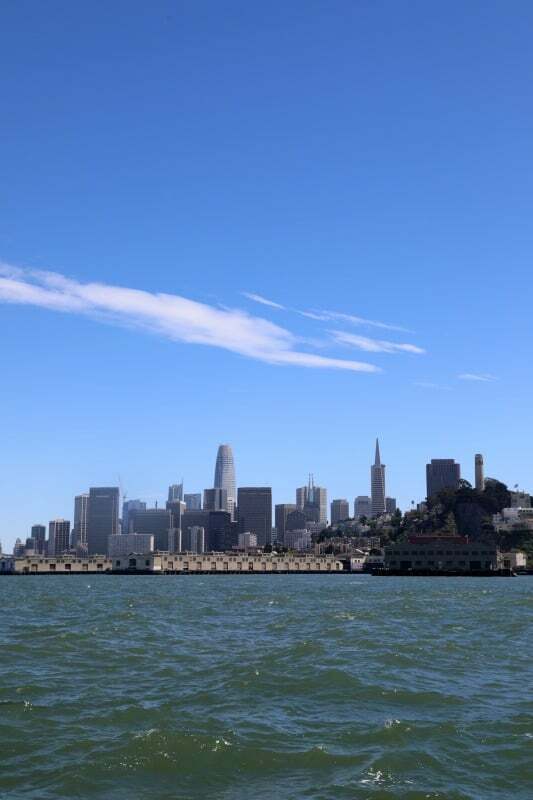 The views of the San Francisco Skyline were unbelievable! Sailings are from 12:30 pm to 4 pm, you will want to plan to arrive before 12 pm to pick up your tickets at Hyde St. Pier. Things to bring with you – Water (no alcohol permitted), snacks, hat, sunscreen, sunglasses, layers of clothing (for warmth and water resistance), closed toe “active” footwear (no high heels), camera, and binoculars if you would like them. 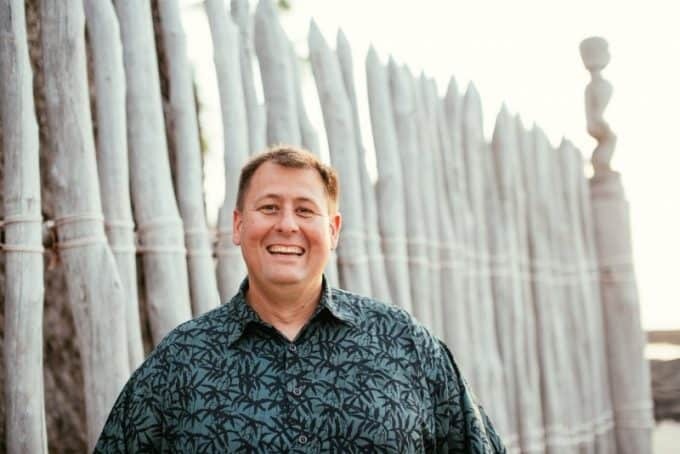 Sunscreen, Sunscreen, and sunscreen….trust me on this! I might have forgotten this key element and the next day I had a nose like Rudolph and cheeks that were quite pink. If you bring a hat make sure to tie a string to it and connect it to your jacket or clothes. It can get quite windy and many people had to grab for their hats to make sure they didn’t fly into the bay. 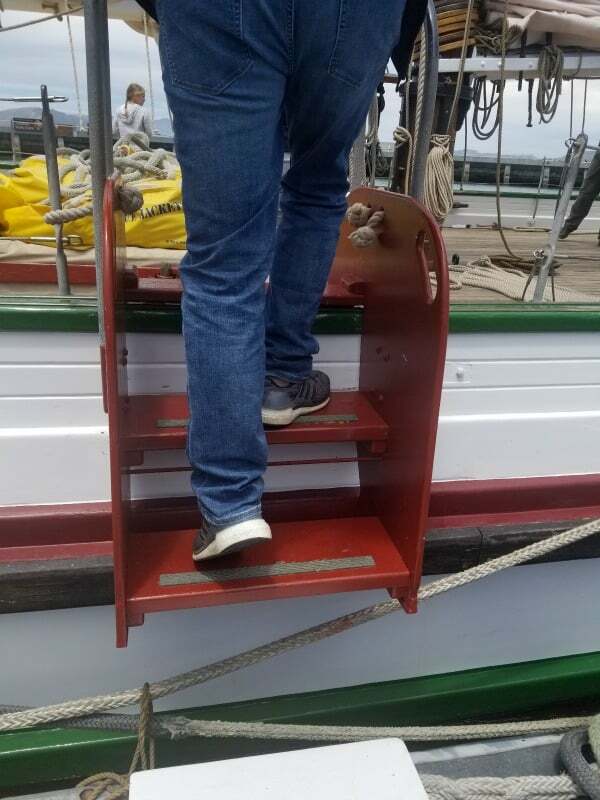 There are a few steps to get up onto the Alma from the dock. Once you have cleared these steps you can spend the rest of the time sitting and soaking in the experience. There is seating available all around the boat you just want to make sure you are in a designated safe zone. The deck crew will point out the areas near the middle of the ship that you can not stand near. 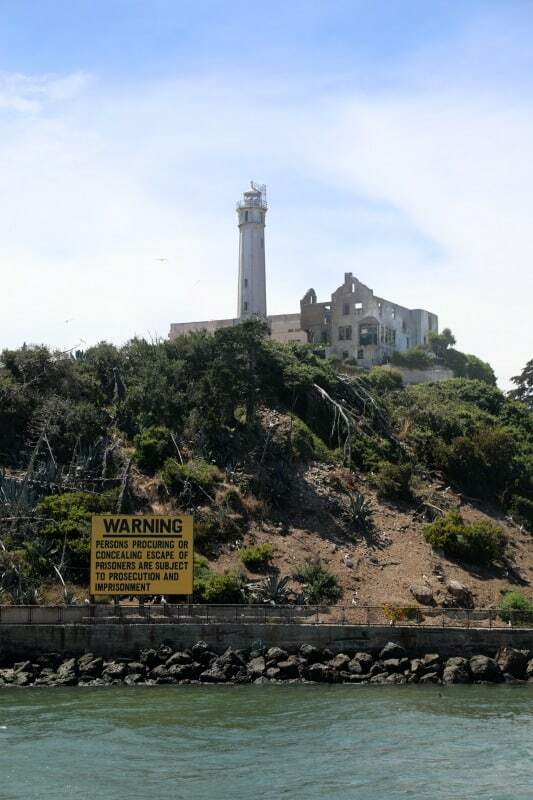 Make sure and plan time to explore San Francisco Maritime NHS before or after your sailing. There are so many cool boats you can tour at Hype St. Pier. There is no food or drinks available on the boat so make sure you have eaten prior to your sailing. We stopped at In and Out down the street for a pretty quick lunch. You can also stop at Cioppinos Seafood Italian Restaurant down the block for sit down delicious Italian.